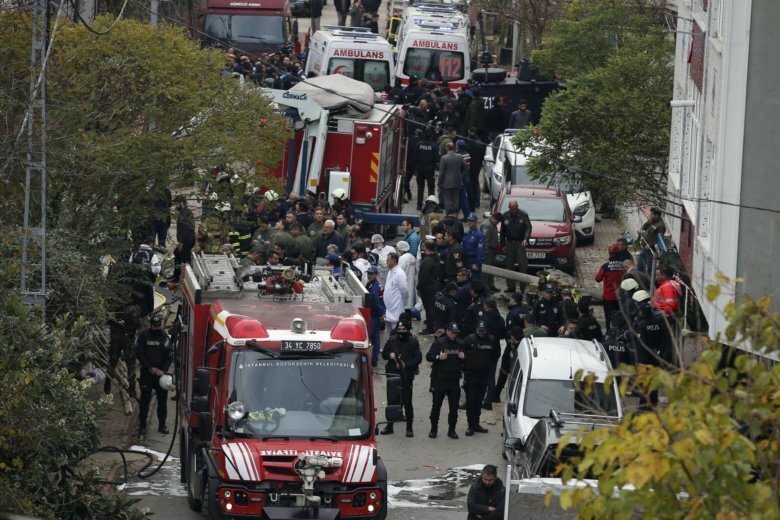 ISTANBUL (AP) — Four Turkish soldiers died while another was fighting for life after their helicopter crashed Monday into a residential area of Istanbul. Even though the helicopter struck a four-storey building before crashing, there were no civilian casualties, according to the state-run Anadolu Agency. The UH-1 helicopter, which was on a training flight, ended up on a street in Istanbul’s Sancaktepe neighborhood — on the Asian side of the city that straddles two continents — while trying to make an emergency landing, Defense Minister Hulusi Akar told reporters at the scene of the crash. The helicopter appeared to have turned over and debris from the crash scattered around the street, according to video footage from the scene. Akar said the pilot appeared to be trying to land the helicopter, which was on its way to the air force base of Samandira, near Sancaktepe, on an empty plot of land in order to prevent civilian deaths. The dead servicemen included two officers and two non-commissioned officers, Akar told reporters. The injured serviceman, a sergeant, was in serious condition and facing an operation. An investigation into the cause of the crash has been launched, he said.